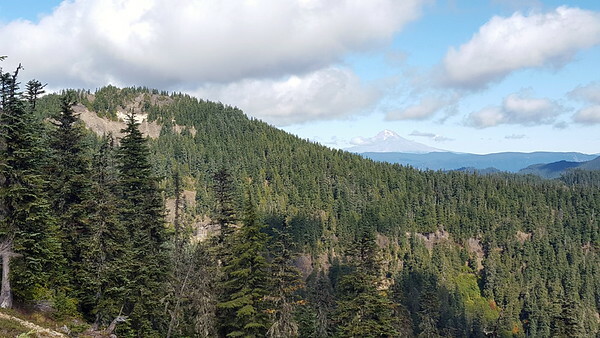 This is a report on a very under appreciated trail - Baty Butte. If you have not experienced this trail, it is highly recommended. This trail could use some more friends - especially the section heading south from the access point junction. Last weekend I decided to hike the Baty Butte trail with the possibility of hiking to the top of the Butte to check out the location of the old lookout. You have to take these VERY slowly as some of them are VERY deep. I'm not sure a passenger car could navigate some of these. 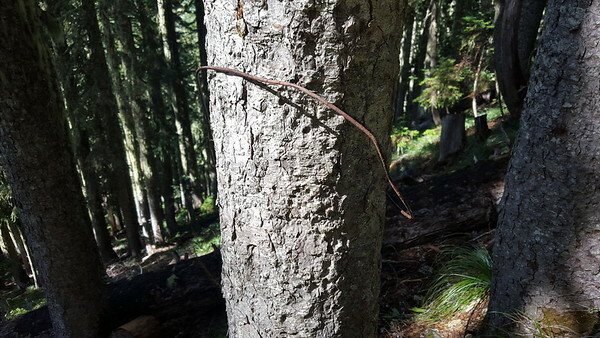 One on the trail, we found some VERY recent trail maintenance! This was done on the connector trail from the 7010-160 road to the junction with the regular trail. A big thank you to whoever did this work. Both logging and brushing were done VERY recently, as well as this piece of tread work, fixing a spot where a root ball had messed up the tread. 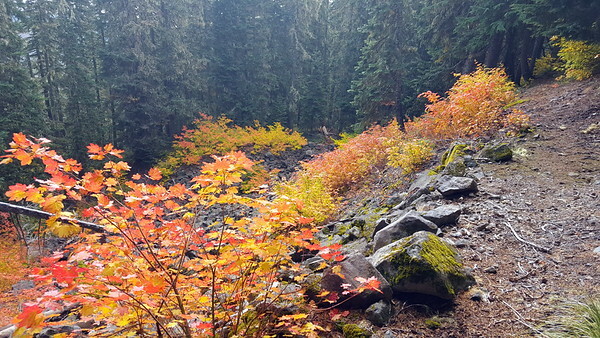 As we proceeded down the trail, we came to the first rockslide and found brilliant fluorescent fall colors - this photo doesn't even begin to do it justice - the colors were so vibrant - it was amazing! We came to the junction and headed north/east - the goal was to get to the top of Baty Butte and have lunch there. On the way up, I met a bow hunter (he was VERY quiet-didn't even know he was there until we were right on top of him) and later met another couple - the husband had a bow but said he really wasn't hunting. 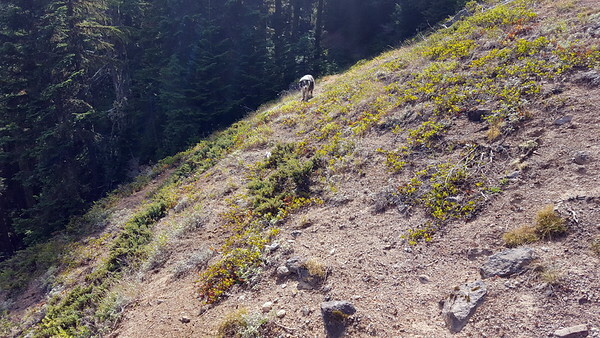 I was very surprised to see others on the trail, although they had both come in from the Lost Meadows access point, not from 7010-160. 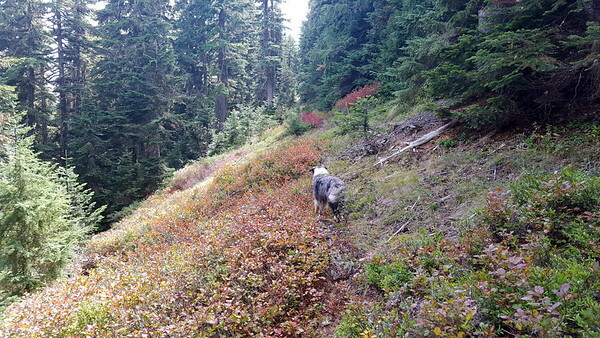 We finally found the real trail again and headed southwest down the trail. When we got to the southern part of the trail, it was obvious it hadn't had much activity. It was VERY brushy in places and had quite a bit of blowdown. 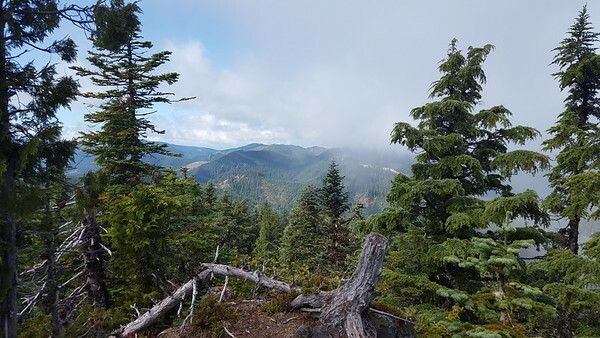 We ended up hiking about a mile south of the junction, and in that mile, we counted about 40 trees down - and some spots in the trail are almost completely grown over with brush. 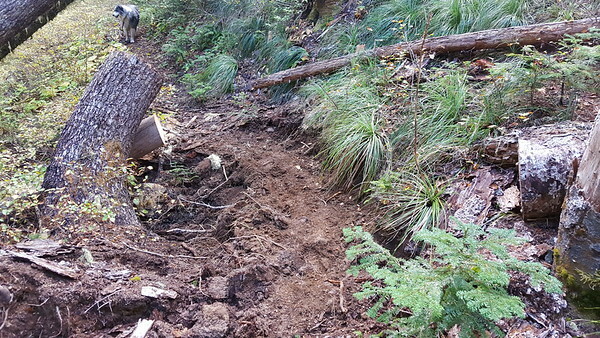 This portion of the trail needs a bit of love. We walked down the trail for about a mile and then turned around and came back. It was a very pleasant day in the woods. 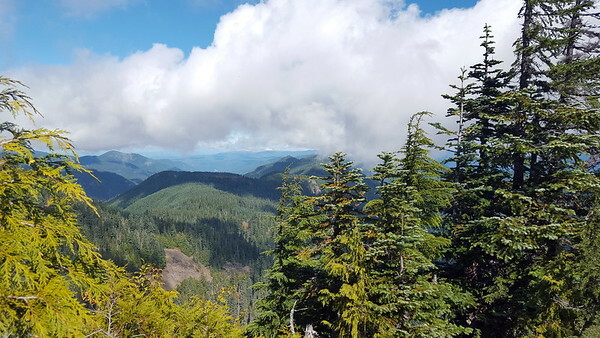 If you have not hiked this trail - especially the southern part of the trail, it is highly recommended. The Baty Butte lookout was not a lookout in the sense of having a lookout structure. It was regularly used. When fire danger seemed to justify it, FS personnel would drag spotting equipment up there and use it until called back down. No lookout building ever existed. The peak is very narrow and before I heard the story I also wondered where a lookout could have existed. The wire whenfrom the north right over the top of Baty Butte and on towards Bagby. The trails up there were never real clear, though they were followable for a maybe a few decades. One went to a overlook above Surprise Lake. Lower down on the east side a trail named Camels Back Way headed to you guessed it the Camels Back. 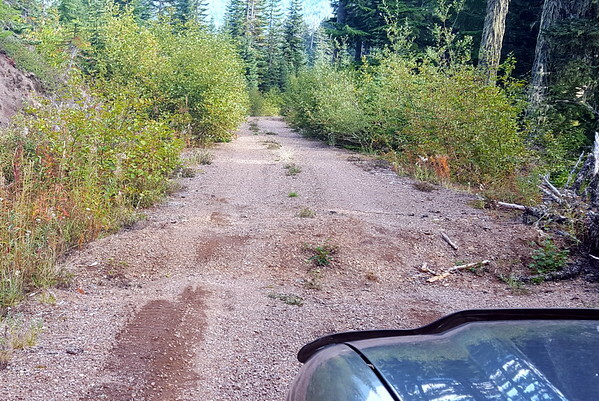 I have yet to find a map that shows this trail, but the "undated trail logs" available on this site mention it. The date for those was most likely 1956. I recently got a copy with that date on a cover that isn't on "undated trail logs". 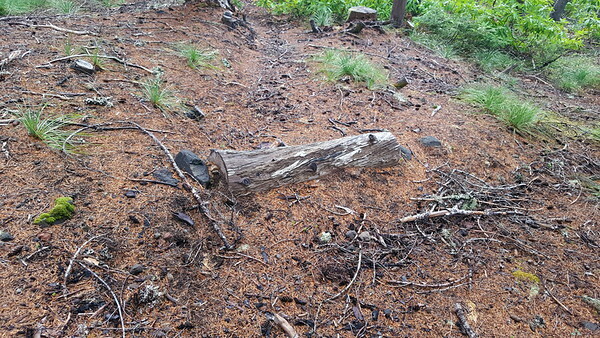 Where you said <<On the way down, we found what appears to be an old water bar in the tread:>> This trail was very much fainter until the route was used by some firefighters a few years back. As they were firefighters the trail became much clearer. There is a fireline uphill from where you took that picture as well. 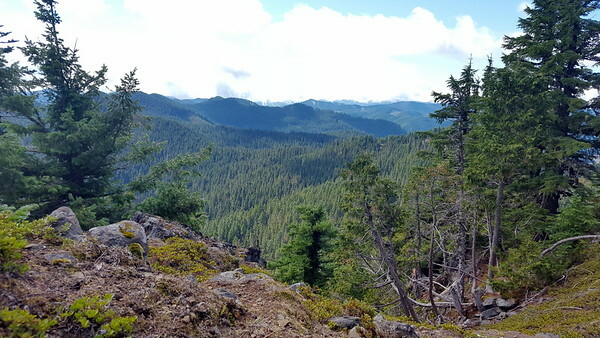 I will add that you can rock scramble up to Old Whitespot on what in now called Baty Butte and from there to the top, all on the west side. I have done that three times. As it is mostly debris flow deposits there are plenty of protruding rocks and they make more than enough hand and foot holds for an easy route as near-vertical routes go. 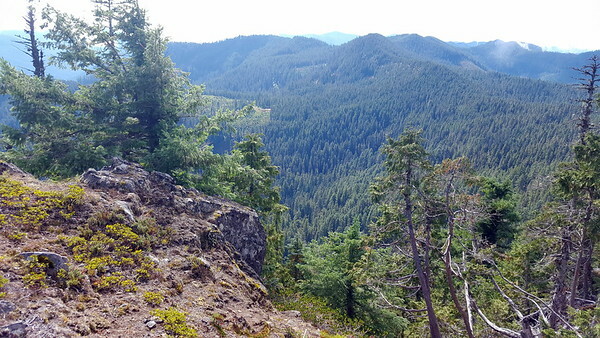 The top of Baty Butte is one of the southernmost spots to find Douglasia anywhere and the plant makes June a good time to do that rock scramble. Yes, the trail south is getting brushy. I whacked the worst of the rhododendron and huckleberry last year, but there has been a year of growth since then. 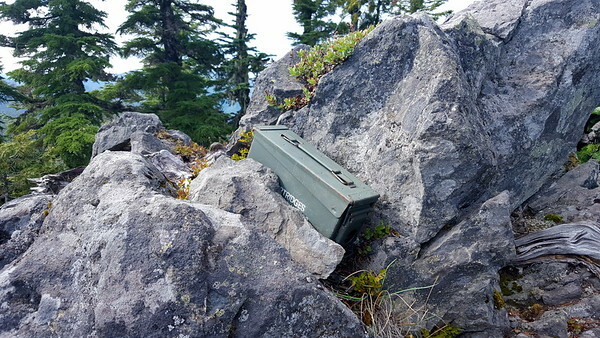 "The first lookout on this site was a tent with a phone placed by the USFS in 1914. In the 1930s a ground L-4 cab was constructed which was gone around 1949." I had understood that there had never been a lookout structure on Baty Butte, but this contradicts that. Although they don't provide the source for this information, it states that the site was nominated for this listing by Ray Kresek, who wrote the book on Northwest lookouts. There is info and some photos of other Clackamas District lookouts on this website which might be of interest. Very interesting info, Doug. I had always heard there was never a structure up there. After having visited that peak, I really have no idea where they put it though. The peak is REALLY small and it drops off pretty quickly. It would be interesting to know the source of that info. Oak Grove Ranger Station Lookout Site - In 1930 the USFS constructed a tower at the ranger station compound. It is now gone. Why would they build a tower down in the valley? Maybe for training purposes? Anybody heard of this before? I looked at the photo of Oak Grove posted from 1935 and I didn't see any lookout in it, but that was just a small part of Oak Grove, so it is possible it was somewhere else. I'd never heard of a lookout being there, though. If it is true, I'd assume it was for some kind of training. Can't imagine what else they could use it for down in the valley. I concur that there is really nowhere for a cabin that size to go, as its a knife-edge peak. There is no sign of a structure ever having been up there. But it is marked as a lookout on some old maps.